I’m so happy you have landed to Weekendlust! A word and blog I’ve created to give a name to my bucket list, and translate it into actions. My name is Rosely Rodriguez and I’ve always had a passion for the unknown and finding it. I never thought about actually going after it though, until I took my first big risk! This made me fall in love with the idea of wanting to experience it and then be able to write about it. If you are an everyday adventurer, trying to make the most out of your weekends (time off), then this website is for you. Here you’ll find free resources and simple changes to apply on your day to day activities, to rescue yourself and, more than saving money, save your biggest asset: Time. Some people think they don’t get the opportunity to go far so often or try new things, especially with so many responsibilities that tend to setback. Even I thought that, until I stopped waiting for the fitting time and did something about it. I’ll show you that you do have time and enough money to check off your wish list items, while hoping my list also serves you as an inspiration for when trying new things in your life or list. Lets first understand the composition of this custom made word: Weekendlust. The period from Friday evening through Sunday evening, regarded as a time for leisure. Feel a strong desire for something. Therefore, Weekendlust is a strong desire for the weekend to arrive. This is usually the free time we have from our work duties. The days I have the most time to adventure and explore. Is the time where I can collect new experiences and check them off my “Bucket List”. Weekends = Leisure which = free time to learn how to play the piano, see new places or even try new foods. My list consists of many things that can be done without having to leave the country, or neighborhood. After a year or so trying to make time for my adventures, I’ve found some resources that I wish I had in the very beginning. It will be helpful if you check them out before you read the rest of the blog’s content. This page will be updated every now and then, whenever I find something helpful for the community. If you are not subscribed to the newsletter, where I’ll keep everyone updated, then read this page regularly to benefit from the new resources. 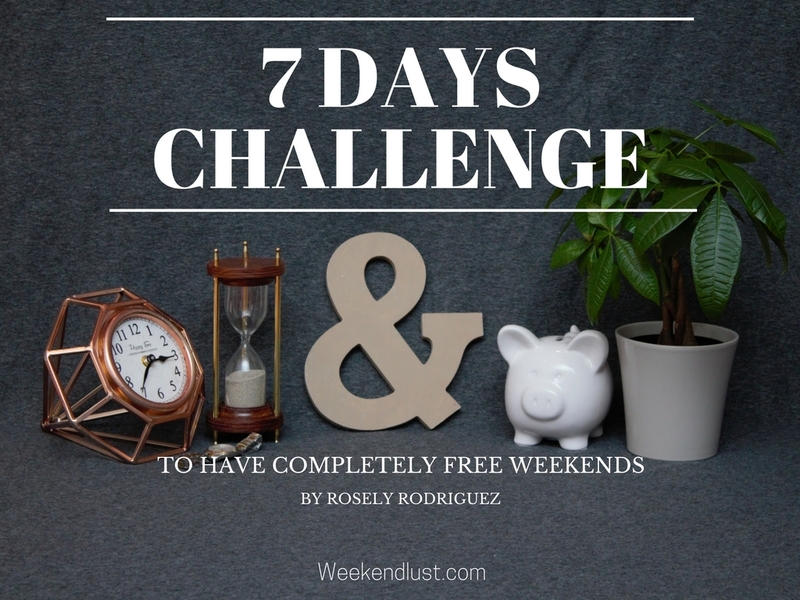 Click here to subscribe and receive the 7 Days Challenge to Have Completely Free Weekends. I’ll start with the best advice I could give you all: Become an experientialist. #1 – The book Stuffocation, by James Wallman. The key to me on this paragraph, and for you to take advantage of this blog is: More to manage and more to think about. Once I removed all the unnecessary stuff in my life, to manage and to think about, I had free up a lot of time for my weekends. Plus my bank account looks healthier and healthier every day, allowing me to be more a “Experientialist”(word learnt from the book) than a “Materialist”. #2 – Use electronic sources for books. If you decide to get this book (or any other), I would encourage you to opt for electronic ways. I’m in love with e-books because placing bookmarks, highlighting text for reference and exploring is a lot easier! Audiobooks are also amazing when trying to spend your time wisely. When commuting to work, or doing other activities that don’t required your focus, such as cleaning, cooking and food shopping, audiobooks allow you to learn something new. I have an hour commute to work for example, just with this activity I have 5 hours to listen to any book on any subject of my interest. Best of all, both of these options are ecofriendly, plus the Kindle and Audible apps can be downloaded on your phone so you can use it whenever and wherever you are. For me, everything started with the Skillshare.com course Travel the World: Dream and Budget for Your Next Adventure by Chanel Cartell & Stevo Dirnberger. “Chanel and Stevo left their comfortable lives in Johannesburg, South Africa in early 2015, to embark on a creative journey around the world. Their mission is to see how far from home they can get – literally to see how many kilometres they can clock up, and figuratively to see how far out of the comfort zone they can push themselves“. Learn more about this couple at howfarfromhome.com. The only problem is that it’s a premium class on Skillshare, you need to pay a subscription in order to be able to take it. Luckily for us, Skillshare has an offer of 1 month for only 99 cents ($0.99)! Click here to get this amazing offer. If you decide to try it out, you should also check the premium Skillshare course Become a SpeedDemon: Productivity & Automation Tricks to Have More Time. Gain 2+ Hrs/Wk Guaranteed! By Jonathan Levi, his time saving advice are amazing. And don’t you worry, you can cancel your subscription anytime. Skillshare has a bunch of other free inspiring courses, so I advise to sign up anyway and watch as much as you can. 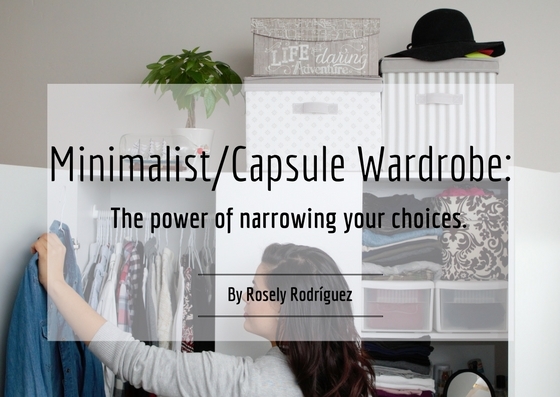 I also created a Skillshare Course: “Minimalist/Capsule Wardrobe: The power of narrowing your choices“. On this 24 minutes course, you will learn what a minimalist and capsule wardrobe is, It’s history, the study behind the many benefits of having one and how to create it, as well as be able to see real life examples. Sing up for this course and let me show you how successful people have taken advantage of this dress code, by narrowing their options and daily choices to focus on what their goal is or was. For the ones skeptical of the possibility of checking off their bucket list with their income, this Podcast episode, from The Budget Minded Traveler, BTM 002: Priorities – How to Afford World Travel with Any Income, will make you change your mind. Learn how Jackie Nourse and her husband, with a combined annual income of 20,000 USD, made it to spent 2 months overseas. This is good follow up on Stuffocation. I quickly recognized the names of two of the producers of this film from the book, when I saw the trailer: Joshua Fields Millburn and Ryan Nicodemus (Aka The Minimalists). This film created and also produced, by Matt D’Avella, allowed me to put a face and a voice to all the examples provided on Stuffocation. I couldn’t miss this documentary, and neither should you. If you are more of an audiovisual type of person, then watch this. It’s available on Netflix. I started to identify myself as an Everyday Adventurer after an e-mail series on Brightpeakfinancial.com. Click here lo land to the e-mail series of examples of people who manage to balance their lives to be able to make time and set money aside for what they love to do, even with all their responsibilities and bills. I haven’t yet used any of their products or apps, but I felt they deserve to be credited for the inspiration. I’m subscribed to their newsletter and love it. This website is part of my recommended resources because you can find solutions to your specific problems. Problems that I’ll probably won’t cover. I don’t have a husband, kids, pets, student or home loans, and so on. Those are the type of cases where their blog’s content can help you better. This app helped keep me on track when managing my finances. Their blog is really good too. Click here to see how it works. Find out more about this and other helpful apps on my email course series “7 Days to Complete Free Weekends”. Looking to quickly find what to do this weekend? Go ahead and check the Weekendlust bucket list! If you have any concern on what action to take while on Weekendlust.com, go check Weekendlust “Privacy, Terms & Conditions” page. What are some things you want to experience? Please Share.